We hope we saw you at the Children with Diabetes conferences in 2012. If we missed you we'll be there in 2013! 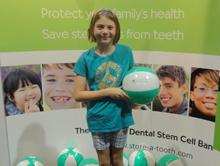 Store-A-Tooth™ will again be providing a free service to families at CWD Friends for Life. Contact us and tell us a little about you - we want to hear your story. - What do you think about the promise of stem cells? - How do you feel about preserving your family's stem cells for potential future use as a treatment for T1D? We want to keep encouraging you to tell your friends & family that you can save stem cells from teeth because without you telling them - they might never know.